Fifty years have passed since one of the bloodiest pogroms agains a Palestinian village took place. Fifty years have not healed the wounds left open by the Israeli troops that massacred 47 innocent civilians returning home from work that day. The wounds fester as fears of ‘repeat performances’ are in the air as the likes of Herr Lieberman enter the government. Israel must learn from the history of the Jewish people… the cry after the war was NEVER AGAIN!! It wasn’t NEVER AGAIN TO US…. IT WAS SIMPLY NEVER AGAIN! We must insure that it NEVER HAPPENS AGAIN…..TO ANYONE! Below is an article just posted on HaAretz…. 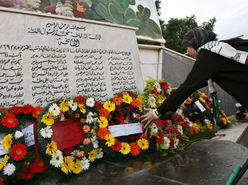 Residents of the Arab Israeli village of Kafr Qasem held memorial ceremonies in recent days marking the 50th anniversary of the 1956 massacre in which Border Police killed 47 Arab citizens who were returning to their village from work. On Sunday, the official anniversary, residents marched and visited the cemetery where the massacre’s victims are buried, laying wreaths in their memory. Kafr Qasem council head Sami Issa criticized during the ceremony the addition of Yisrael Beiteinu to the coalition. “This is not the way to achieve peace,” said Issa. Lieberman has called for certain Israeli Arab communities to be transferred to Palestinian Authority control, in exchange for the retention of West Bank settlement blocs. The founder of the Islamic Movement in Israel, Sheikh Abdullah Nimer Darwish, Hadash MK Dov Khenin, and Latif Douri, who documented the survivor’s stories, also participated in the ceremony. Schools throughout Israel also marked the anniversary, following a directive from Education Minister Yuli Tamir, who instructed schools to devote time to discuss the massacre and the events that occurred following it, including the court ruling that a command was “blatantly illegal,” and in such a case, soldier should not have obeyed it. On October 29, 1956, during the first day of the Sinai war, three Border Police received a command to shoot anyone who broke the curfew imposed on Kafr Qasem. The soldiers involved in the incident were sentenced to lengthy prison terms, but all received pardons. The brigade commander was sentenced to pay the symbolic fine of 10 prutot (old Israeli cents). A memorial commemorating the massacre was recently raised in the village. According to the Kafr Qasem municipality, a museum dealing with the events of October 29 will open its doors to the public on the incident’s anniversary. This also just in from HaAretz…. obviously some people never learn and will have to be taught the hard way.. perhaps a good, stiff prison sentence will mellow this fascist beast. Elisheva Federman, the wife of extreme right-wing activist Noam Federman, was indicted Sunday for incitement to racism. The Jerusalem District Attorney based the indictment presented to the city’s Magistrate’s Court on remarks made by Federman, a resident of the West Bank city of Hebron. The remarks were recorded on two occasions – first, by Haim Yavin in the documentary film series “Land of the Settlers,” and later by a Channel 10 team in a story on Purim celebrations in Hebron, which was never aired. “I say in the best circumstances we need to expel them… If they don’t leave? We’ll kill them… They’re enemies. We have to fight them. If they don’t leave, we’ll start bombing them. That’s the only thing that will help… We don’t need to put on airs. We’re in a war. A la guerre, comme la guerre – we must act as if we’re in a war,” she said. “The entire Arab street supports the suicide bomber… everyone is complicit in such an act. We can give them an ultimatum to leave here with their possessions intact, and if not, we’ll simply send… planes and bomb them and hold on to our land,” she added. In conversation with a Channel 10 reporter, Federman praised Baruch Goldstein, a West Bank settler who opened fire on Muslim worshippers at Hebron’s Tomb of the Patriarchs in 1994 before being beaten to death. “The 39 Arabs Goldstein killed is a drop in the bucket compared to what needs to be done. There needs to be a real war. We need to conquer this land once and for all,” she said. Federman is charged with one count of incitement to racism and two counts of attempting to spread incitement.